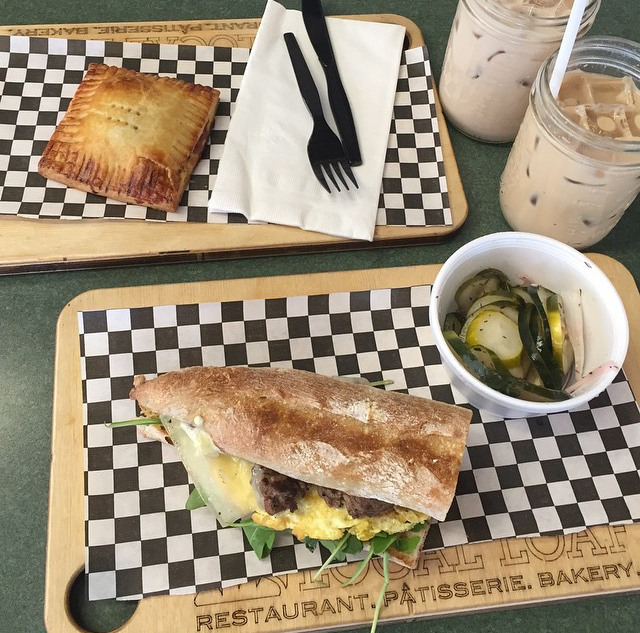 Background: Local Loaf opened in May 2013 and is located inside of 7th Street Market. Chef Adam Spears makes innovative sandwiches and other entrees using freshly baked artisan breads. Order this: Charlotte Agenda recently named their BLT one of the best sandwiches in Uptown. Their version puts a uniquely southern spin on the classic: pimento cheese, popcorn shoots, and tomatoes of the fried and green variety. Other sandwiches to try include the Chicken and the Egg (hand breaded chicken tenders, Cheerwine sauce, biscuit), and the Steak and Egg (with marinated skirt steak and scrambled eggs). From the bakery case, you have to try the homemade pop tarts and the muffins (mostly the tops—duh). Dessert: Anything from the bakery case will do (see above)…or you could go next door to Cloud 9 for any of their fabulous confections. You should at least go and stare at the case while you wait. Atmosphere: 7th Street Market is almost always bustling, but it is usually not difficult to find a seat somewhere. While it can get noisy here, it’s still a comfortable place to sit and eat, drink coffee, and people watch. Southern Hospitality: Service is counter-service, and it is, well, serviceable. Frankie’s Notes: Sandwiches served on cool wooden boards; southern cheese spreads; pop tarts for grownups; people watching as an Olympic sport; why do they even make muffin bottoms? Parking: Street parking or in the 7th street garage, which you can get validated inside.